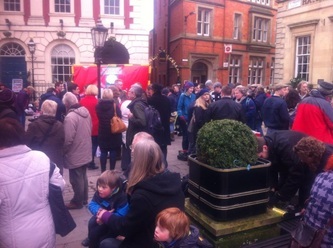 The bedroom Tax/spare room subsidy protest took place in the town square by the cenotaph in Newcastle Under Lyme, North staffs on Saturday March 30th, run by North Staffs stop the cuts/ North staffs socialists/North staffs stop the bedroom tax jointly. I was there in my many hats, robed up representing the Warband as a Warrior priestess and the Battle raven, but also representing Disabled people against cuts, 4up ( which is an online group I admin with supporting people against the welfare reforms and supporting them with benefit claims and info) also there supporting members of Black Triangle campaign for the disabled, and supporting stop the cuts, march on stoke, north staffs socialists, supporting Kidsgrove Town Council against the bedroom tax and welfare reforms - so I had many heads on. I arrived there with the deputy mayor and members of Kidsgrove town council, who help me out and gave me a lift ( and got me the coffee to keep me warm) - and I joined with all the other groups I know and support with, including members of Stoke Anonymous who were present and kept an eye on me and helped us to get people to sign the petition calling for the councils not to evict people.. we got 300 signatures in 2 hours on the petitions to Stoke City and Newcastle Borough councils. We were all there, roughly 60 of us, from 12.30 until nearly 5pm. We encountered a lot of heckling and verbal attacks, mostly people shouting tell them get a job and its not a tax.. to which we pointed out most of the people claiming who are been effected are low paid and part time workers and agency workers, and carers and the disabled. We heard heart breaking stories from carers and cancer patients and people in wheelchairs and people with sight impairments. One paraplegic lad has been told to pay or move, when £15.000 has been spent adapting the 2 bedroom bungalow he lives in and he keeps his scooter and therapy things in the spare room with a bed for carers when he needs them. I also spoke to a lady with cancer who uses her spare room for her daughter to stay over with her when she is having chemo or needs someone with her. We had a lot of widows who are single parents talking to us, and single mothers who work who are been hit with these charges as they claim working tax credits etc. The deputy mayor of Kidsgrove stood there representing labour councillors against the bedroom tax along with most of the town council members. He has come under a lot of attacks on line over his stance off people, so this druid stands firm by his side, as he is a good person with a kind heart who stands against all forms of abuse and attacks up on single mums and the poor etc. I was frozen on the demo, and it really did tell on my arthritis, but I stood there all the same ( full of pain killers) defending people. Members of anonymous made me a cushion to sit on out of placards and a sleeping bag and the chairman of march on stoke kept running my hands for me to keep my circulation going. In all we made a good presence, people were afraid though, to ask me what my robes were ( which has never happened in the past over the years) so members of stoke anonymous and march on stoke kept telling people not to be afraid and just to ask me.. many had never heard of us at warband, and others the moment I mentioned Newbury in the 90s remembered it in the newspapers. I got thanked by people that the druids are standing by the people. One christian chap I stood with sent me an email thanking me and that it made him have hope for the future by seeing the faiths both pagan and christian standing side by side united against tyranny and oppression. This Battle raven is now attending regular stop the cuts meetings and bedroom tax protests when able to, and is also attending stop trident stop cuts meetings locally (meeting Bruce Kent in stoke this month) and also Meetings over care home abuse as well and supporting whistle blowers ( who still are not protected). This bedroom tax will force many disabled out and into care, as there are not any one roomed disabled bungalows in rural areas for the under 60s that are adapted. 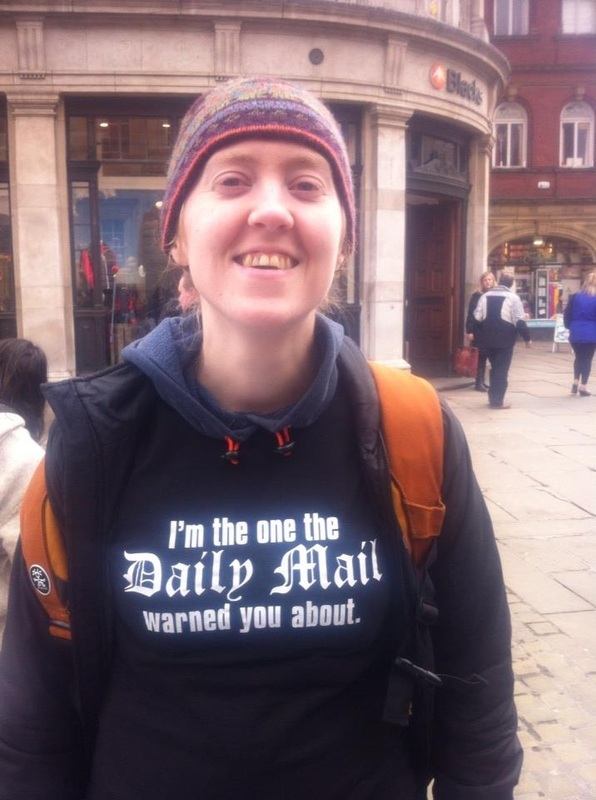 I had an email from a christian chap I was chatting to at the protest yesterday. It said 'I was proud to be standing next to a Druid opposing this evil tax on the most vulnerable in society.When the faiths unite against tyrants It gives me hope. I was pleased to have met another spiritual person to stand at a protest with'. I thought that was rather a nice email to open first thing in a morning. The People are 'rising up' against this Government and their 'clawing back monies from those who can least afford it to prop up those who least need it. 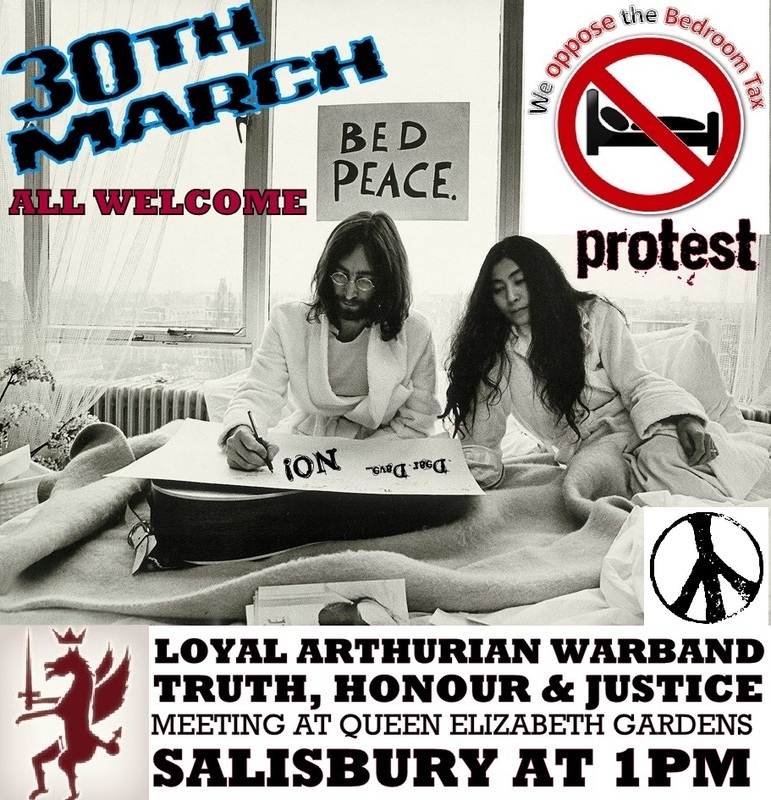 Join us at Queen Elizabeth Gardens between 1.00 and 3.00 pm on 30th March 2012 - come robbed up, in fancy dress and with banners - all peaceful protesters welcome. On the 16th March 2013 at 30 different sites across the UK, people gathered to protest against the Bedroom Tax due to be implemented on the 1st April. No, not an April Fools - just a huge injustice to the already struggling poor and discriminates against the disabled and those who care for them. 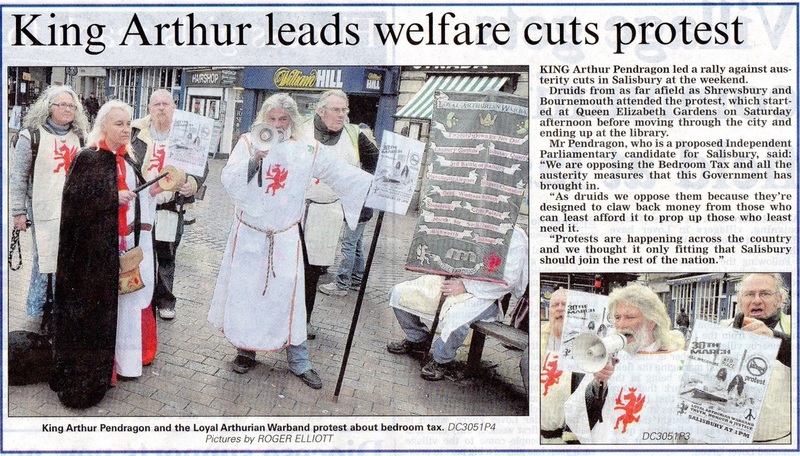 The Loyal Arthurian Warband attended the following protests and below is the account from the members who went along. More protest days have been planned and updates on these will be given as and when we receive them. "Have you received a letter from the York benefits service warning you about changes to housing benefit coming in April 2013? Does the letter tell you your benefits could be 'cut' because you are an 'underoccupier'? You are not alone: 2000 households across York will be affected. And we can stop it! What is happening to benefits and council housing? If you live in social housing, are of 'working age' (16-61 years) and are deemed to have 'more bedrooms' than you need, then from April 2013 you stand to lose between 14-25% of your weekly housing benefit entitlement - often over £10 per week. 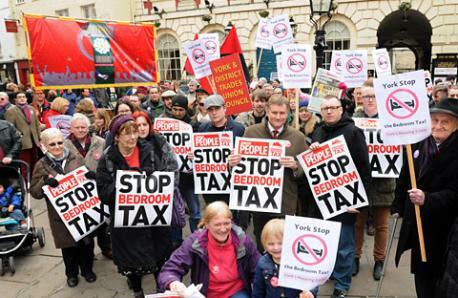 The bedroom tax: why is this happening? The government says the taxpayer should not pay for 'spare bedrooms' and they want to force tenants to 'downsize' to a smaller property. This is completely bogus; the real problem is the shortage of council housing. The Tories let private rents soar after 1989. This is why the housing benefit bill is high - tax payers are subsidising private landlords. The Labour council in York doesn't know what to do. It says it doesn't like the policy and had admitted that it cannot possibly re-house everyone affected in the smaller properties. There aren't enough of them! - Make the shortfall from other income - get into debt? - Try to find work or more hours at work - what work? Where? - Take in a lodger - who would that be? If you are worried about what's going to happen to you and other people in your area, get in touch! " 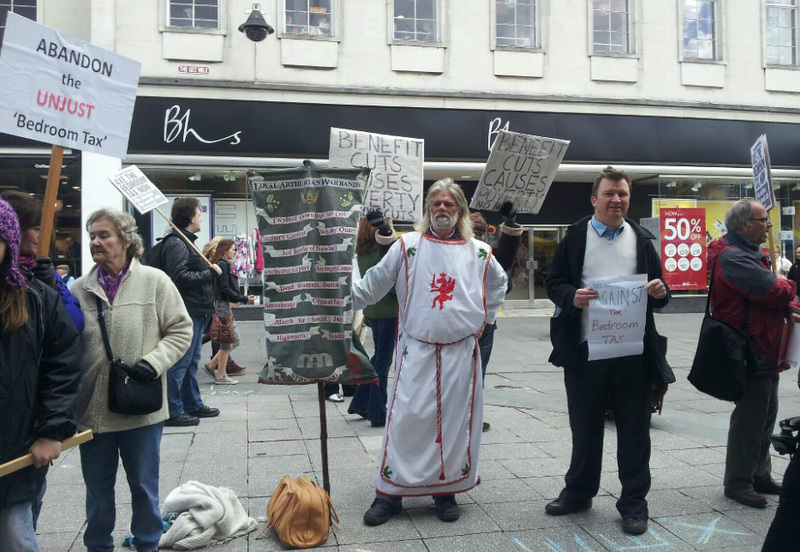 King Arthur attended The Southampton Rally, as a fully Robed Druid, angered at this Governments determination to claw back monies from those who can least afford it (the poor) to prop up those who least need it (the Bankers) He joined the people of Southampton in protest. The Battle Standard was on parade resplendent in the names of previous protests our Order has been involved in, and Arthur promised by the end of this summer to fill a new one as we take to the streets against the Unjust Austerity measures brought in by this government. A special thank you to Blue Boar Flowers of Salisbury for their sponsorship, cheers Toney for paying for the Kings Train ticket. 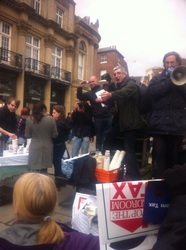 Naomi (LAW webmistress and Warrior Priestess) attended the York protest. "I arrived at midday as it was due to start at 12.30. 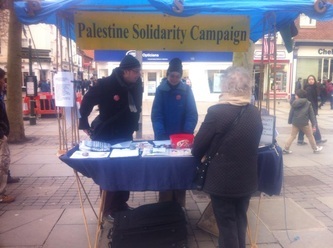 The only people there was the Socialist party stall, where I hung out til the organisers arrived around 1pm. The Labour MP Hugh Bayley was there and spoke out against the Bedroom tax. Next was the Greenbenches and political parties and then there was me. 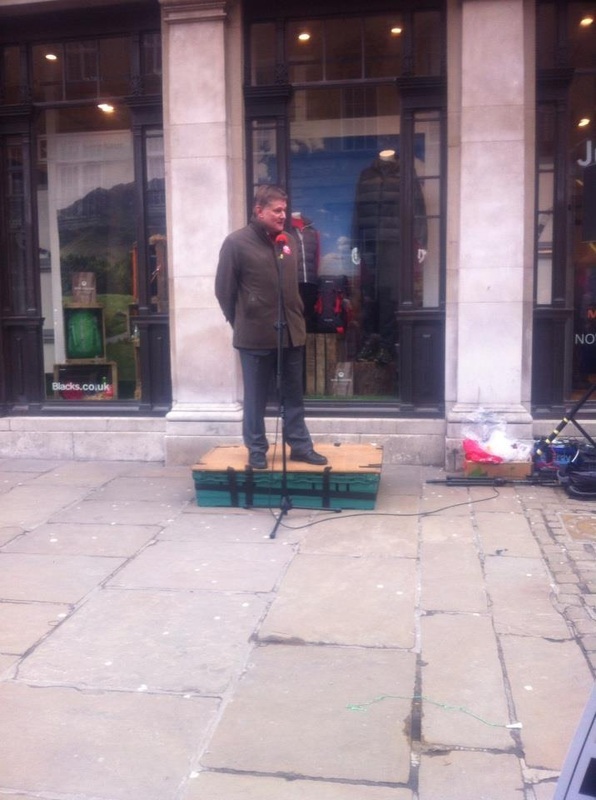 I introduced myself and said I represented the Loyal Arthurian Warband and that we were against the Bedroom tax. I stated it was not only unfair but illegal and told them how it was personally affecting me. I spoke out about the other cuts, ATOS reviews and how desperate I was to find work. I told them of my struggles, that my last paid job was £22k a year and yet I can't even get an intervew for a petrol station position! Most of the time you do not even get acknowledged for your application and in two years of applying for jobs every week, I've had 5 interviews. I told the crowd that I was going to request my spare room to be bricked up because I can't afford to pay and refuse to pay this illegal tax. I got a big round of applause and then I was pounced on by the MP and some other groups who were interested in my story. Another lady from Scarborough (about 60 miles away) took to the mic next and told her story about how it would affect her and her two kids (with her). There were people who worked for these departments that were bringing in the cuts and they spoke of worse to come."